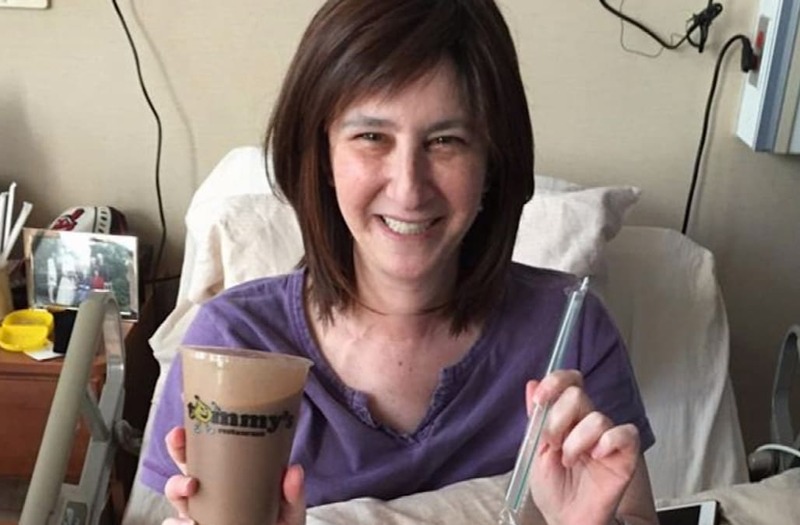 A woman's dying wish to have one last milkshake became a reality, thanks to the effort of her childhood friend and the owner of an Ohio restaurant. The request came as Emily Pomeranz, originally of Cleveland Heights, Ohio, was battling pancreatic cancer for a second time in the Washington, D.C., area. While in hospice in Arlington, Va., her lifelong friend, Sam Klein, asked what he could do for her. "She said, 'Well, I recently lost my hair again — I'd love an Indians hat, a Cleveland Indians hat,'" Klein told InsideEdition.com. "I was happy to share mine; we're big Cleveland sports fans." Pomeranz, 50, then told Klein how badly she wanted to have a mocha milkshake from Tommy's, a restaurant in Cleveland Heights they had enjoyed growing up. Klein wanted to make her wish come true and emailed Tommy's owner, Tommy Fello, telling him Pomeranz's story. "That's our famous shake," Fello told InsideEdition.com. "I said, 'Boy, we've never done something like this across state-lines in the mail, but let me give this a shot.'" Klein called UPS and asked if sending dry ice could be feasible, and it was up to five pounds. "We whipped her up a shake, packed it in dry ice, [and] were able to ship it to her," Fello said. "She got it within 9 hours." The milkshake was sent from Ohio to Virginia — about 375 miles — and Klein said Pomeranz's reaction was priceless. Pomeranz saved some of the milkshake to share with her two brothers, Russell and William, later that day. "The next thing I see is on Facebook of this beautiful picture of Emily with a gigantic smile from ear to ear and she's holding her mocha milkshake and I'll tell you, my heart just exploded," Fello said. That same picture of Pomeranz with the milkshake in her hand quickly went viral. Pomeranz died on July 28. Her obituary said she will be remembered "for her laugh, her sense of wonderment, her persistence in the face of adversity and her ability to connect with everyone around her." "It's really nice that people want to do something small to make a big difference in someone's life," Klein said. "We're still at a loss for having lost Emily." He added: "She was such a great person but when I see her picture on Facebook and the comments which have been so positive and so genuine, people sharing stories of their loves they've lost, it's really nice." Additional reporting by Elissa Candiotti.